A remarkable thing happens when a person exchanges processed fast foods, soft drinks, candy, artificial flavorings, additives, pesticides, herbicides, hormones, preservatives, hydrogenated fats, and pounds of sugar, for health protein, grass fed beef, plentiful veggies and fruits, carbs that are whole grain and come from vegetable sources, as much organic as one can afford, and proper nutrition supplementation! We have the power to turn our health and well-being around! So, you're thinking, if my body already detoxes, why should I worry about it? So, here is the answer! Without added support, your body may have a hard time keeping up with today's modern world and food! Some of our bodies systems are equipped with a natural detox system. And with just a little love, caring and nutritional support, their powers get stronger. Coffee enemas, the Master cleanse. Broth or Fruit-only diets. When you hear the word detox, is that what comes to mind? With sketchy programs like these abounding, it’s no wonder many people run from the word detox. But don’t be too quick to reject the idea of detoxification altogether. We have a gentler system; Nutrition Reset. Eating to promote your body’s natural detox functions can help you look and feel better every day. Your liver, neutralizes environmental toxins that can trigger a range of health conditions. Your kidneys filter our blood. Your skin sweats out toxins. And your digestive system eliminates toxins through its waste elimination process. However, our body's internal workings, our biochemistry, was never designed to handle the toxic burdens that our modern day diet, SAD (Standard American Diet) and environment delivers. The mounting stress of it over time, can cause the functioning of our body's systems to be compromised. 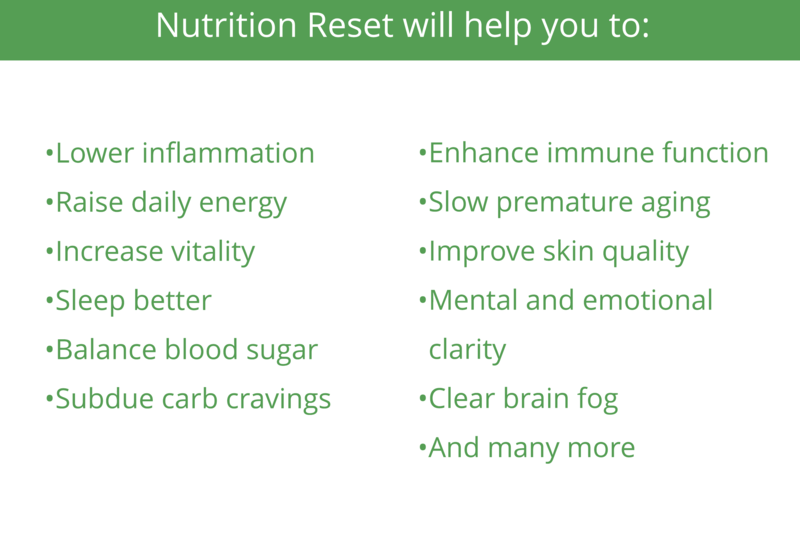 This is where a Nutrition Reset fits in. It's been developed to bring your body back to it's natural state of wellbeing and vitality. Every so often we need a break from all the activities, the news, the noise, and chaos of everyday life. That's when we go on a retreat, or away with a dear friend or spouse, in need of some downtime. Well, your body needs some downtime too. 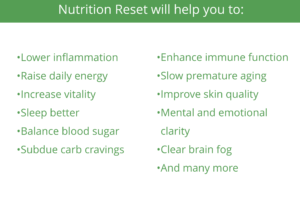 A Nutrition Reset gives your body that downtime! It allows your internal systems to go on "retreat" if you will, and refuel with healthy food and nutrients. By feeding your body clean food, getting better sleep, increasing quiet time, journaling, daily body movement, and removing inflammatory foods, nutritional supplementation. Our Nutrition Reset, distance based program, is customized, and personalized to your needs. It is available as an "on your own" program, or with nutritional coaching along the way. The Reset program has different time lines available as well. For the different options available you can click on the picture. "Marietta is wonderful to work with. We discussed a meal plan, exercise goals, nutrients, habits, emotions, and lifestyle changes that would benefit me in the long run. I appreciated her style and holistic approach. She’s worth every penny! Great results! :)"